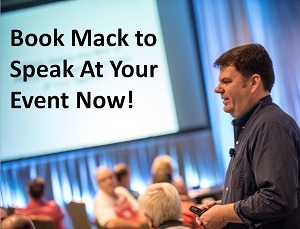 Note from Mack: This is a guest post by my pal Jay Baer. 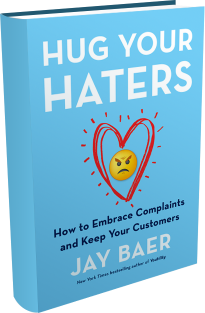 Besides being recognized as one of the top experts in digital marketing, Jay also has a new book called Hug Your Haters (check it out on Amazon) and this post is drawn from that book. Enjoy! Whether you work for a mom-and-pop store or a global brand, you do have haters — and you can’t afford to ignore them. By embracing complaints, you put haters to work for you, and turn bad news good. Customer service and customer experience matter. And they’re going to matter even more in the future. The world is inextricably linked now, by transportation and technology that was unthinkable twenty years ago. This global interconnectivity mutes the advantages of price and location that businesses formerly used to create market inefficiencies and gain a disproportionate share of customers. Take Bloomington, Indiana, for example. There are more than one dozen banks in this modest-sized college town where I live. All of them offer almost precisely the same core services, at fees that are not appreciably different from one another. From the perspectives of product and price, they are nearly indistinguishable. There are even more pizza places nearby, and they all offer roughly the same thing at the same cost, partially because they are buying ingredients at the same price from the same global suppliers, and are tapping into the same labor pool, where what you pay a college student to make pizzas is essentially the same for each restaurant. Likewise, my accountant and your accountant and my barber and your barber are doing almost the exact same things for approximately the same fees. Why do I always order from the same pizza place in Bloomington? Because I live on the outskirts of town, and they cheerfully deliver to my house. Most of the other pizza places give me the terse “outside our service territory” story and refuse to bring me pizza. The winning companies of tomorrow will be those that make their customers feel the best, even if those customers are paying more for the privilege. This isn’t just a circumstance that’s true in consumer products, travel, and hospitality either. The customer intelligence consultancy Walker released a research report that stated that in business-to-business scenarios, customer experience will be more important than price by 2020. “The B-to-B companies that will win are beginning to prepare now by recognizing the shift that’s taking place, aligning the right resources, and focusing on the right metrics. Enlightened companies must view the customer experience as a strategic initiative. And, in the future, the responsibility of a ‘chief customer champion’ will become more common, serving one purpose-to create an unrelenting focus on the customer,” states the report. There are many elements of a comprehensive customer experience program. The first step in differentiating your business with customer experience should be to be demonstrably better than each of your competitors in how you embrace complaints. Start there, and if you can successfully hug your haters, you’ll be on your way to a full-scale customer experience advantage that can literally be the difference between a flourishing business in five years, when price and location are no longer deciding factors, and not existing at all. Drawn from Hug Your Haters: How to Embrace Complaints and Keep Your Customers, about which Guy Kawasaki says: “This is a landmark book in the history of customer service.” Written by Jay Baer, Hug Your Haters is the first customer service and customer experience book written for the modern, mobile era and is based on proprietary research and more than 70 exclusive interviews. I love this. I recently called-out a coffee shop for stellar service (http://stevecase.org/5-reasons-i-visit-an-inconvenient-coffee-shop-and-you-should-too/). They not only earned my business as a customer, but I’m also an advocate. I’m intrigued by the idea that “Customer experience will be more important than price by 2020.” Then again, there does seem to be a spike in poor service lately. Maybe as the cost of poor customer experience goes up, price sensitivity is correspondingly pushed down. Love this post – customer service really is so important. It’s the little things that really matter to a customer; they don’t see the big picture of the business, just the service they receive on their order. Not only patience is essential to clients, who frequently connect with support team when they are confounded and disappointed, but on the other hand it’s imperative to the business too. Thanks for the Guest post. I did put the book in my Amazon wishlist. Customers service, taking time to listen the customers, taking time to explain and share the story behind your business/company/service is so important. What’s more rewarding than a customer that keeps coming back to you, because of the quality of your work! Yes, customer service is the new marketing. And that is the key to building a solid relationship with prospective and esteem customers whereby there is a win-win between the business and the customers. Can’t wait to lay my hands on the book. Thanks for this great guest post!